Overnight Cinnamon Rolls | Have YOU Ben Starr Struck? Don't even think about saying "Cinnabon" GROSS! Who on Earth can resist a warm, yeasty, sticky, sweet cinnamon roll fresh from the oven? ESPECIALLY if there’s cream cheese frosting to smear on top? The problem is that it takes a solid 3 hours to get cinnamon rolls finished once they are started, and who wants to get up THAT early? The solution, which is actually an IMPROVEMENT as well, is to start the cinnamon rolls the night before, so that they can be in the oven baking 30 minutes after you wake up, and ready to eat in another 30 or so. 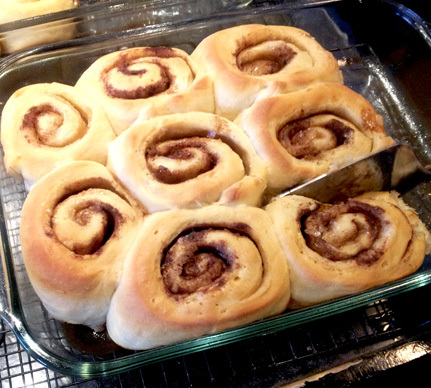 I’ve tried and tried and tried to cut the whole prep time down to 1 hour, start to finish, which I’ve successfully done with yeast rolls and English muffins…but it just doesn’t work with cinnamon rolls. If you want the right flavor and texture, you gotta give ’em time. Stir until smooth. Then add additional flour (up to a cup or more) until it comes together into a soft dough that can be kneaded. Turn out onto a lightly floured surface and knead for 10-15 minutes. (Or leave it in your stand mixer to knead for 8 minutes.) You don’t want the dough to be too stiff, but it shouldn’t be so sticky that you can’t work with it. Place the dough in a large greased bowl, cover with plastic wrap, and let it sit in a warm place until risen double, about 90 minutes. Push it down to deflate it, and let it rise until double again, another 90 minutes. Gently roll the dough up into a log about 18-20″ long. Pinch the edge firmly to seal it. Cut off about 1″ from each end and discard. Then cut the log into 12 cinnamon rolls. The easiest way to do this is with a long piece of dental floss that you wrap around the log and tug each end, which neatly slices the dough. A knife makes the job very messy, dental floss or kitchen twine makes it a cinch. Place the rolls into greased glass baking dishes. A 12×9 pan will barely fit them…I generally do 2 9×9 pans or my giant 15×11 pan. Cover the pans with plastic wrap and place the rolls into the refrigerator for up to 12 hours. The next morning when you wake up, put on a kettle of water and bring it to the boil. Place a regular pan on the bottom rack of your cold oven. When the water is boiling, pour the water into the pan. Then pull the cinnamon rolls from the fridge, remove the plastic wrap, and place them in the oven on the middle rack. The steam from the hot water in the pan below will “wake up” the yeast and warm the rolls to the proper temperature for the oven. After 25 minutes, pull the rolls from the oven. Please a cooling rack upside down onto the top of the pan and flip the whole thing, rolls and all, upside down. Let it sit for 30 seconds, then flip the whole thing back over right side up. This helps all the boiling sugar which has poured out the bottom of the rolls into the pan to soak back into the rolls…but don’t leave it upside down for too long or the juices will all run out. This step is optional but it helps make sure you don’t leave lots of sticky goodness in your pan. If you don’t have the strength to flip over a screaming hot pan of cinnamon rolls, just let them sit on the counter for 10 or 15 minutes and they will reabsorb much of the sugary juices. Let the rolls cool for a bit before frosting, but definitely frost them when they are a little warm. I recommend frosting the rolls on your plate after you remove them from the pan. If you frost them ALL before they are served, they become very messy to serve. Beat on high speed until the frosting is light and fluffy. This entry was posted in Breakfast, Recipes, Vegetarian, Yeast Breads and tagged cinnamon, yeast. Bookmark the permalink. This recipe looks great! I want to try it sometime soon. One thing I would suggest is to adjust the kneading stage of this and instead of just flat out kneading the dough, utilize Richard Bertinet’s stretch and fold technique to develop a softer and more luxurious dough. Stephen, that’s definitely an improvement. You’ll find that most of my recipes are either optimized for convenience, or exhaustively meticulous for perfection. This recipe is one of those convenience recipes…as few interactions with the recipe as possible, so that it gets done for breakfast in the morning. There are LOTS of bread making techniques that would dramatically improve the flavor and texture of this dough, but will increase complexity in the process. GO FOR IT, and let us know how it turns out!! !